Public Health England has welcomed a NICE local government public health briefing aimed at tackling TB in vulnerable groups. PHE’s recently published TB annual report showed 8,751 cases were reported in the UK in 2012, and those most at risk were individuals from ethnic minority groups. People with social risk factors such as a history of homelessness (2.4% - 194/8,088), imprisonment (2.8% - 225/7,918), or problem use of drugs or alcohol (2.8% - 228/8,019), as well as the elderly, also have a higher risk of developing TB. 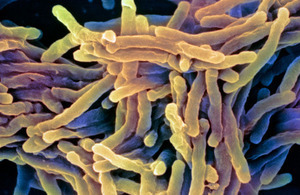 - multidisciplinary TB teams should identify and support an ongoing TB education programmes for local professionals in contact with vulnerable groups, such as staff in accident and emergency departments, GPs, housing officers, people who support vulnerable migrants as well as those working in walk-in centres, hostels, substance misuse projects and prisons. Dr Lucy Thomas, Head of TB Surveillance at PHE, said:"PHE supported NICE to develop this briefing, which identifies the actions that local authorities and partner organisations can take at a local level to help tackle TB among vulnerable groups. Implementation of these recommendations will help to reduce TB transmission and health inequalities in our most vulnerable populations." TB is an infection caused by bacteria and usually affects the lungs, but can affect other parts of the body. Vulnerable groups, such as people who are homeless or in poor or temporary housing, vulnerable migrants, people who have spent time in prison, and people who misuse alcohol or other substances are at particular risk of developing the disease.